This Easy Crock Pot Baked Beans Deluxe is a vintage recipe that I updated. Welcome to the first recipe in my new Vintage Recipe Project. This is something I have been wanting to do for a real long time. I have been collecting vintage recipe boxes and cook books for years. Recently my mother in-law gave me some cook books that belonged to her mother and grandmother. I will treasure them along with the other vintage cookbooks that I have collected over the years. But because the ones she gave me have recipes from my husbands family I will cherish them even more and pass them down to my own children. I don’t have anything like that from my mother or grandmother. I have wanted to share my collection in hopes that someone else might appreciate the home cooks and bakers that came before us. How could I do that I wondered. Well as a tribute to all of our momma’s and grandma’s I have decided to make some of the recipes that catch my eye as I am looking through these wonderful cookbooks. I’ll make adjustments as needed but these vintage recipes will be the inspiration behind them. As you may know some recipes from long ago are not written for the modern day cook. There are some ingredients I have never heard of. Some of the measurements are a little vague. One that comes to mind is a crust recipe that calls for 5 knife tips of sugar. So although this project may be a bit challenging at times and I may end up wasting a bunch of ingredients I am ready to dive right in. Some of the recipe booklets I have collected come from churches or schools. Way back in the time of our grandmother’s churches and PTA’s would collect recipes and make a book to sell as a way of collecting money for the church or organization. In these books each recipe has a name listed. I will be posting these names along with the location where the book/booklet came from. I hope someone who may be researching their family history might have the pleasure of running across one of their ancestors recipes right here on my blog. Mrs David MacKay may have lived in or near Dover Ohio as this is one of my husbands great grandmother’s recipe booklets and she lived in Dover Ohio. This recipe takes two days to make since we are using dried beans. The beans need to soak overnight then cook low and slow the next day. I cooked them in my slow cooker. Celebrate those old time vintage recipes with me in The Vintage Recipe project. 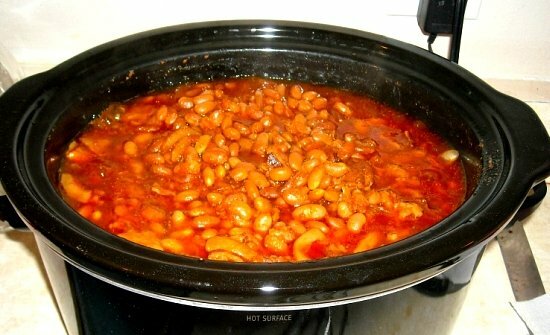 The first recipe up is this vintage Baked Beans Deluxe recipe made in the crock pot. Rinse and clean the beans the night before. Put them in a large pot and cover them with water. After a couple of hours they will have absorbed most of the water. Pour off the water and fill the pot again so the water is about two inches over the beans. Cover and soak over night. The next morning pour the water off and rinse the beans again. Fill the pot again so the water is about two inches over the beans. Add 1 tsp of baking soda to the pot and bring to a boil. Boil the beans for about 20 minutes. Drain beans. Put the beans into a large pot or a slow cooker and add enough water to cover the beans one inch. Add the rest of the ingredients. If cooking in a pot on the stove bring to a boil and lower heat to a simmer. Simmer beans for about 4 1/2 hours or until the beans are tender. Add a small amount of water as needed. Stir occasionally. If using a slower cooker, add the beans, add water to cover the beans one inch. Add the rest of the ingredients and stir everything together. Turn the slow cooker on and cook 8 to 10 hours or until the beans are tender. The recipe called for 2 lbs of Great Northern Beans but I only had 1 1/2 lbs on hand. It worked out just fine. Also the original recipe did not call for brown sugar. The beans turned out very good. I served them with pulled pork sandwiches. I really like that you are trying some old recipes..beans are always welcome in my house too, and you made them so tasty! this looks absolutely amazing! im starving hungry right now and this looks goooooooooood!!!! Such a great project you're doing and im so looking forward to reading more posts. I recently bought a book which holds many passed on recipes from different parts of the states and thedy have been collected from ptas, local churches, cookoffs etc….its a great read and some great recipes that are delicious! I love this post! I think older recipes are the best but sometimes trying to figure out the nuances is rough (Im still trying to figure out one that my mom used to make). Can't wait to try this. What a great project! I have a bunch of old family recipes I have collected over the years too. It's such a great way to continue the "family traditions". Some of the recipes I learned from were actually ones my Mother learned in her home economics class, probably around the early 1930's and I am still using them. I think this same recipe baked in the oven on slow…225 deg.or less would be super also. Remember those great baked beans??? You make mention of the fact that brown sugar was not part of the original recipe, but did not explain why you added it. If I may ask, in a respectful way, why did you? How did it change the taste from the original vintage recipe to the new version with your brown sugar update? Sorry to be a pest, but the old reporter in me wants the following questions answered in all stories and recipes: Who, What, When, Where and Why. Hi Bill I added the brown sugar because I love the sweet flavor brown sugar adds to baked beans.